Third version of Yokai Watch due out in December. 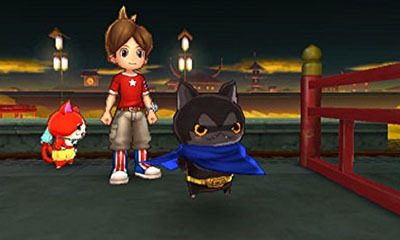 HMV Online has the first direct-feed preview of Yokai Watch 2: Shinuchi, the newly announced third version of the popular 3DS game. Due out alongside the Yokai Watch movie, Yokai Watch the Movie: It’s The Secret of Birth, Nyan!, on December 20 in Japan, Yokai Watch 2: Shinuchi will have a special episode linked to the film. Like Yokai Watch 2: Ganso and Honke, some of the ghosts you can befriend and quests you can take on in Shinuchi are different. But of course, you can still exchange medals and battle against users with the other versions. You can use save data across all versions, too. Shinuchi also includes the Buchinyan Z Medal, the back of which features a QR code to get the super rare “Jibakoma” in the game. View the first screenshots of Shinuchi at the gallery, via Amazon Japan.